The sommelier (somurie ソムリエ ) is a wine steward who helps you choose a wine in a restaurant or an expensive wine shop. A sommelier or wine steward, is a trained and knowledgeable wine professional, commonly working in fine restaurants, who specializes in all aspects of wine service as well as wine and food matching. The role is more specialized and informed than that of a wine waiter. The principal work of a sommelier is in the area of procurement, storage, wine cellar rotation, and to provide expert service to customers. The modern word is French. It derives from Middle French where it referred to a court official charged with transportation of supplies. This use of the term dates to a period when pack animals would be used to transport supplies. The Middle French probably finds its origin in Old Provençal where a saumalier was a pack animal driver. Sauma referred to a pack animal or the load of a pack animal. In Late Latin, sagma referred to a packsaddle. by a certified sake sommelier! The author of this site, Ad Blankestijn, is an officially licensed Master Sake Sommelier and Sake Instructor. Both licenses were obtained from the Sake Service Institute in Tokyo. Ad Blankestijn is active in promoting sake and spreading knowledge about sake in various ways, for example by giving sake workshops and doing tastings in both Europe and Japan. Ad also works as Director Overseas Marketing and Sales for the Daishichi Sake Brewery, which provides him with first-hand knowledge “from the source.” But it goes without saying that he does his sommelier work from a neutral and independent stance. connoisseur of food a "sommelier" of some kind. has become a vegetable sommelier and started a trend of male sommeliers of all kinds.
. . . CLICK here for Tamura Photos ! Especially in the town of Hamasaka 浜坂, Hyogo pref. A haul of crab and firefly squid is the largest in Japan. Female crab is especailly delicious.
. . . CLICK here　for Photos ! With many books available on the market, just click on the thumbnail. How do you get children to eat more vegetables? The Japan Vegetable Sommelier Association organized courses in Tokyo recently for youngsters aged 5 to 9 in which trained chefs tried to help them overcome their yuck instinct. You can take a course of becoming a fruit and vegetable sommelier, since 2001. 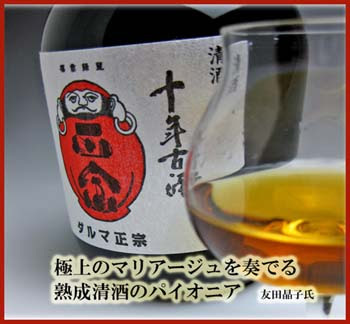 The sommelier Tomoda Akiko ソムリエの友田晶子 has rated this Daruma Sake. "fish promoting in life as they grow larger"
What kind of career and promotion, you may ask? Well, as they grow up they change their name, and some say, the flavor when used in food, they have noticably distinct flavor profiles as they mature. 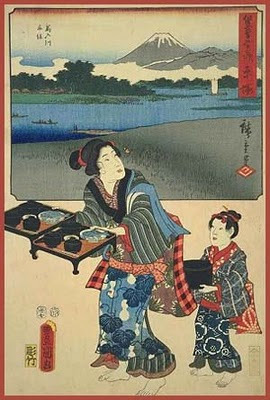 In former times it was custom to cook such fish when a boy was born and later celebrated his "coming of age" ceremony. The traditional GENPUKU げんぷく【元服】 of a samurai boy was celebrated according to family and political situation when the boy was around 11 to 16 years. Also when advancing in their carreer the samurai would change name frequently and thus celebrate with an appropriate fish dish with such an auspicious fish of his region. A katagaki, kata-gaki かたがき【肩書】official position, degree or title is very important and always written on your meishi, visitor's card. It is literally the "writing on your shoulder" and defines your social position. These fish were also eaten for the New Year celebrations. They were called with different names as they grew larger and were sold on the market with these different names. There are also many regional variations about these fish names. The latin name for these fish does not change when they grow older and refers to the grown-up fish. 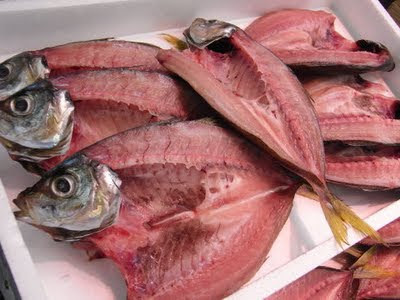 maguro マグロ, the tuna fish, does change its name, but is not counted among the shusse-uo. This holds for unagi eel and shake salmons too. Der Gelbschwanz gehört zu den glückverheißenden Fischen, die „Karriere machen“ (shusse uo), das heißt, er wechselt je nach Körperlänge seinen Namen. Bis zu 35 Zentimeter heißt er in Westjapan TSUBASU, von 35 bis 60 Zentimeter HAMACHI, von 60 bis 80 Zentimeter MEJIRO oder MARUGO. Der erwachsene Fisch von mehr als 80 Zentimeter Länge ist dann der BURI. Weil er als glückverheißender Fisch angesehen wird, ein Fisch der „Karriere macht“ und bei jedem Neujahrsfest „ein Jahr älter wird“, wird er bei Festessen bevorzugt gegessen. Der Gelbschwanz darf in der Neujahrsuppe von Westjapan (zooni) nicht fehlen. Die Königsmakrele gehört zur Familie der saba-Makrelen. Sie wird je nach Länge anders benannt und gehört so zu den glückverheißenden Fischen, die „Karriere machen“ (shusse uo). Bis zu 40 bis 50 Zentimeter heißt sie SAGOSHI, von 50 bis 60 Zentimeter NAGI und mehr als 60 Zentimeter ist es dann die Königskmakrele, SAWARA. Sie kann bis zu 115 Zentimeter lang werden und bis zu 13 Kilogramm wiegen, die weiblichen Fische sind etwas größer wie die männlichen.
. Shussebora 出世ボラ　/ 出世螺 Shusse Horagai . From a conch shell to a Dragon ! originally it was inada . . .
Kintaro, the Strong Boy of Japanese Legend, see below with Daruma. 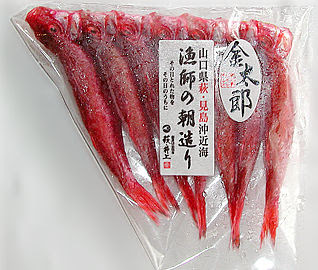 There is a small red sardine, about 15 cm long, locally called "Kintaro キンタロウ" because of its color, that is caught in the trawling nets in Hagi and Shimonoseki and a few other ports along Western Japan. It is not usually sold in the fish stores of Japan, only regionally. In English, it is called ゴートフィッシュ "Goatfish", in China 羊魚. Its sweet red meat tasts good as tempura or grilled with salt. To prepare a sashimi is bothersome, but makes for a very tasty snack. It is also dried as it is, maruboshi 金太郎丸干, and sold as a local souvenier in Hagi. The town of Hagi 萩　is lately trying to promote more dishes with this fish to make it a specialtiy of the city. 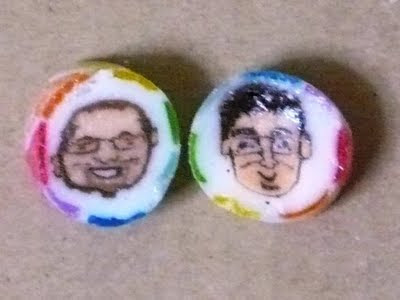 Kintaro ame (candy) has been made since the middle of the Edo period, by layering different colored pieces of candy into a cylindrical face, pull it long to a stick and cut it in small pieces. Other patterns can be included too. Cocoa and caramel are used to color the pieces. It used to be sold on the special festival days of local shrines and temples and kids enjoyed the differend faces coming out of each cut. 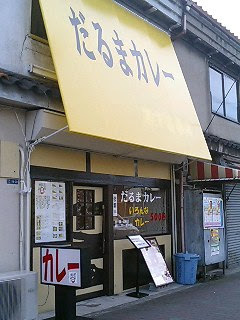 The original store which made this sweet is in the Daitoo ward in Tokyo, 金太郎飴本店. Read the legends and stories HERE. chin chirorin is an imitation of the sound made when cutting the sticks into individual candy. This senryu is a parody about the new political situation in Japan, Septemper 2009. Curry is a dish of India, but in Japan it has taken on a life of its own. 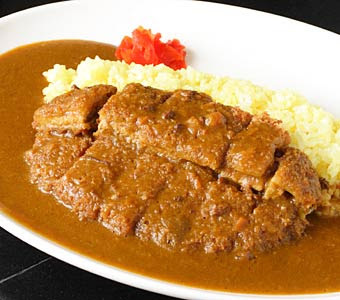 Curry (カレー, karē) is one of the most popular dishes in Japan. It is commonly served in three main forms: curry rice (カレーライス, karē raisu), karē udon (thick noodles) and karē-pan (bread. Curry rice is most commonly referred to simply as 'curry' (カレー, karē). A wide variety of vegetables and meats are used to make Japanese curry. The basic vegetables are onions, carrots, and potatoes. For the meat, beef, pork, chicken and sometimes duck are the most popular, in order of decreasing popularity. Katsu-karē is a breaded deep-fried pork cutlet with curry sauce. at a time when India was under the administration of the British. The dish became popular and available for purchase in supermarkets and restaurants in the late 1960s. It has been adapted since its introduction to Japan, and is so widely consumed that it can be called a national dish. As curry rice was introduced to Japan via English cuisine, it was originally considered to be Western cuisine. 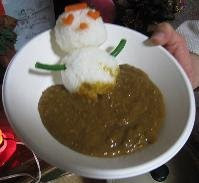 Curry sauce (カレーソース, karē sōsu) is served on top of cooked rice to make curry rice. Curry sauce is made by frying together curry powder, flour and oil, along with other ingredients, to make roux (ルー, rū); the roux is then added to stewed meat and vegetables, and then simmered until thickened. Adding potatoes to curry sauce was introduced by William S. Clark of the Sapporo Agricultural College, due to rice shortages at the time. 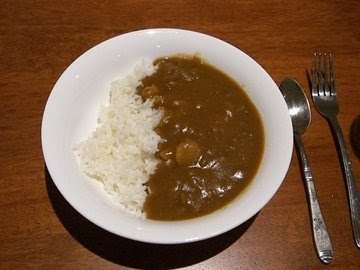 While curry roux and curry sauce are strictly speaking not the same, many people do not distinguish between the two, and it is common for people to ask for 'extra roux' (ルー増し, rū mashi) when ordering extra curry sauce in restaurants. 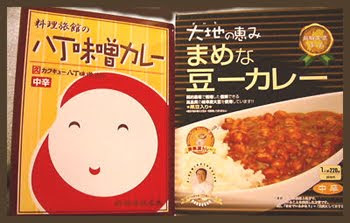 Instant curry roux カレールー was first sold in powder form by House Foods in 1926, and in block form by S&B Foods in 1956. Vacuum-sealed curry sauce, prepared by heating the pouch in hot water or the microwave, is also popular. It is served in small stand-only shops in the stations, Indian restaurants or curry restaurants, where it is served extra in a silver bowl. Indo karee インドカレー "Indian Curry"
Fujisan karee 富士山名物カレー "Curry a la Fujisan"
gotoochi karee ご当地カレー "local curry"
A shop in Kurashiki offers more than 60 varieties of local curry during the hot summer of 2010!
. . . CLICK here for more local curry Photos ! A Book with recipes from 47 prefectures of Japan. hokki long shell, Spisula sachalinensis. prepared in small factories for the local people. With hacho miso and beans and other ingredients. This is very popular, especially with children. Because of the auspicious meaning of KATSU (to win) this is often eaten to pass an examination. a kind of dry curry, with low-fat salami from local cows. On top of this a special demi-glace curry sauce. similar to beef curry, but with pieces of pork meat. Made fresh or sold in tins. Curry ingredients are cut to big pieces and boiled in the soup. Vegetables, potatoes, carrots, paprica. Some even ladle this over boiled rice. Often processed into a Tokyo Curry. rice and curry for dinner." my husband likes it REALY HOT ! According to some recent scientific study, a regular dose of curry keeps Alzheimer's at bay. Idli is a steamed rice ball from south India. people tend to want the ambulance just as we sit down to eat! The most important part of washoku. It dates back to the time when no refrigerators were available. shun is also the time when a vegetable (or something else) is "at its best" as a kigo for haiku, for example the ants in summer. Most of the ingredients for cooking are also kigo. Vegetables from a hothouse are found in the stores at any time of the year, they are never SHUN. Vegetables of the season are full of the energy of the season, full of nutrition and vitamines and best for the human health. Vegetables produced on the free land have a lot more energy than those from the greenhouses. In summer the energy circle is at it's hight. Most plants produce fruits and vegetables to eat, like cucumbers, eggplants or tomatoes. In autumn, many grains and fruit or nuts from trees are harvested, like rice or persimmons. Natural energy tends to provide for the next generation already. In winter, natural energy takes a rest. Now most of the roots of vegetables are eaten, like radish and turnips. They have a lot of fibers and are a great addition to the winterly nabe hodgepodge dishes. Within each season, the FIRST hatsumono 初物　of something was also a great pleasure for the gourmets of Edo. 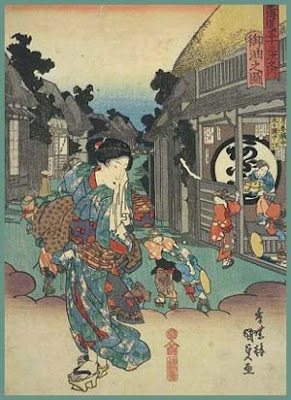 Ships would race to carry the first catch of bonitos, hatsugatsuo, hatsu gatsuo, to fetch a good price or bring it as a special present to the Shogun of Edo. First rice or first tea of the season are also well known specialities. for more details about dishes with these seasonal ingredients. asparagus, endomame beans, jagaimo potatoes, kyabetsu cabbage, nanohana mustard flowers, retasu lettuce and salads, tamanegi onions, udo Japanese spikenard and many more. kyuuri cucumbers, mame-rui all kinds of beans, nasu eggplants, serori cellery, shishitoo hot peppers, shooga ginger, tomato, toomorokoshi corn, zucchini. kabu turnips, kabocha pumpkin, kinoko ki no ko mushrooms, ninjin carrots, rakkasei peanuts, piiman paprica, satoimo sato-imo yam, satsumaimo satsuma-imo sweet potatoes, shiitake mushrooms, tororo-imo yamspotatoes and many other mushrooms. daikon radish, hakusai Chinese cabbage, hoorenso spinach, karifurawaa cauliflower and broccoli, komatsuna, kyoosai Kyoto vegetables, naganegi leek, renkon lotus roots, shungiku garland chrysanthemums, yamaimo yama-imo yam and others. is a genus of over 600 species of flowering plants in the family Dioscoreaceae, native throughout the tropical and warm temperate regions of the world. The vast majority of the species are tropical, with only a few species extending into temperate climates. yama no imo ヤマノイモ（山の芋）"root from the mountain"
There used to be about 13 different wild ones in the mountains of Japan. They came to Japan via China as a cultivated plant. There are no wild ones. They are the most popular, grown all year as "ichinen imo" 一年芋. 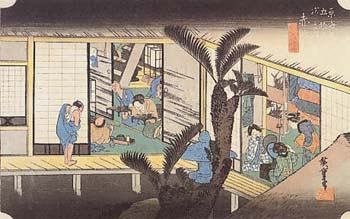 Also called "tokkuri imo" トックリイモ（徳利芋). In Okayama prefecture, Kibi Chuo Town, mochi are prepared with these roots. gingko leaf root, ichoo imo イチョウイモ（銀杏芋）because of the form. These are also called "hands folded in Buddhist prayer" busshoo imo ブッショウイモ（仏掌芋）. In the Kanto area, they are called "Yamato imo" ヤマトイモ（大和芋). Varieties are "tsukuneimo" ツクネイモ（つくね芋）, "Tanba no imo" 丹波山の芋, Iseimo 伊勢芋. The roots of this plant are only edible after getting rid of the bitterness. It is eaten in some areas by the poor farmers. has traditionally been referred to as a "yam" in parts of the southern United States and Canada even though it is not part of the Dioscoreaceae family. The word yam comes from Portuguese inhame or Spanish ñame, which both ultimately derive from the Wolof word nyam, meaning "to sample" or "taste"; in other African languages it can also mean "to eat", e.g. yamyam and nyama in Hausa. The majority of the vegetable is composed of a much softer substance known as the "meat". This substance ranges in color from white or yellow to purple or pink in ripe yams. the name derived from the Portugese, which introduced this vegetagle from Cambodia (カンボジア kambojia ... kaboja）. The Chinese characters imply "a gourd that came from the south (Nagasaki)" 南瓜. 花梛菜（はなはぼたん）hana habotan "Blumen-Pfingstrose" flower-peony. The second Chinese character 梛 is NAGI, Podocarpus nagi, Japanische Steineibe. Grown in Yamaguchi prefecture, a mix between broccoli and the chinese vegetable saishin 薄葉細辛Asiasarum sieboldii is called hanakkori はなっこりー and is sold since 2003. 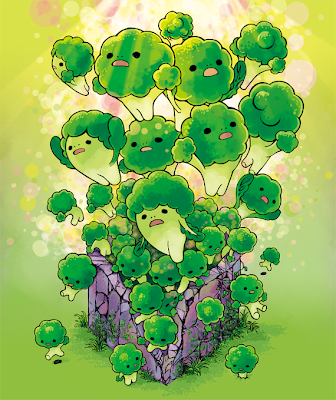 A mixture of broccoli and cauliflower is called romanesuko ( ロマネスコromanesque) in Europe, but in Japan it is karikkorii カリッコリー. Main growing areas are Saitama, Aichi, Hokkaido. Both vegetables came to Jaan after the Meiji restauration in 1868, not only as a vegetable but as a flower to enjoy in the garden. 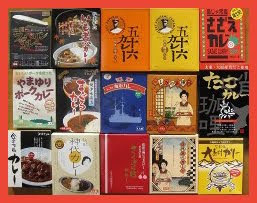 After WWII it became more widespread as food in Japan, together with a wider influnece of Western food. komohcihana yasai 子持花椰菜（こもちはなやさい）"vegetable with a flower that has children"
nezumi daikon ねずみだいこん/ ねずみ大根 "rat radish, mouse radish"
from Shimabara. It has a very strong taste. They are quite small and thick. hatsuka daikon 二十日大根 ( はつかだいこん) "20 days old radish"
Shinshu-ji-daikon, Maesaka-daikon, Oyadakarami-daikon, Akaguchi-daikon, Daimon-daikon, Tatara-daikon, Togakusi-daikon, Wattera-daiokn わってら大根, Haibara-daikon, Maki-daikon, Kirehamatumoto-ji-daikon and more varieties. taka no tsume 鷹の爪 "tallon of a hawk"
Kyooyasai, kyoyasai, kyosai 京野菜 / 京菜 Vegetables from Kyoto.
. Takana 高菜 mustard greens .